We are industry leaders in training of Dangerous Goods in Transportation. Being based 20 minutes outside of Washington D.C., we have access to many government regulatory agencies. Many of whom we train and provide our hazmat services for. 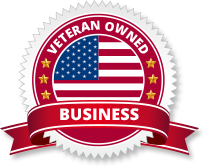 Along with government agencies, we provide training for many Fortune 500 companies, DOD, DOS Contractors, Freight Forwarders, Airlines, Federal and Civilian Agencies to name a few. 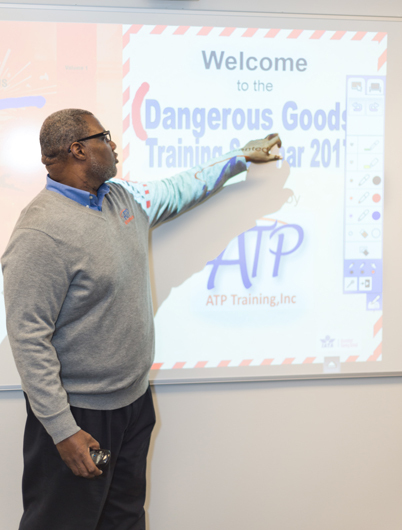 Why is ATP a key industry training leader in the Dangerous Goods Community? 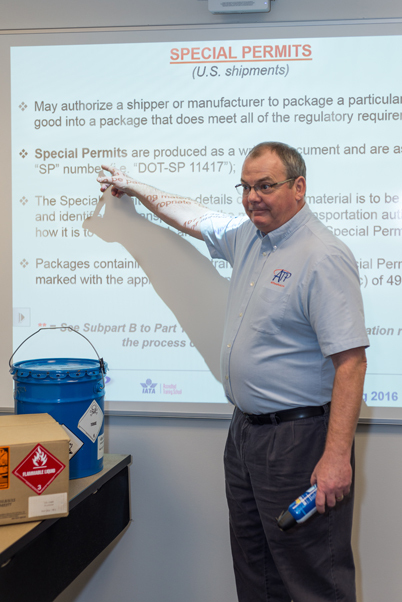 ATP Training Instructors have combined over 100 years of Dangerous Goods training experience. ATP is one of Eight (8) IATA accredited training schools in the U.S. The only one in the Washington D.C market. To maintain our accreditation, our courses for shipments by air are accredited yearly. ATP is a GSA Scheduled Partner. This makes it easy to use our services if you are a government employee or contracted with the government. ATP is a Dangerous Goods Service Company. We “Practice what we teach”. This requires that ATP is always current with regulation changes. Updates are taught in our training. ATP does provide access for class participants with one of our instructors to observe product received then prepared for shipping. This can include proper marks/labels certification and packaging. ATP after the training support. Once training is completed ATP will support each student in real world application for as long as they need us so long as they were trained by us. 49 Code of Federal Regulations (CFR) Sections 172.700-172.704 Subpart H “requires that a hazmat employer shall ensure that each of its hazmat employee’s is trained in accordance with the requirements prescribed in this subpart”. ATP understands the law and have developed our courses to meet or exceed requirements of 49 CFR. Training provided with new interactive classroom equipment, offers organizations a competent level of training which can help to mitigate risk to their employees, their shipments and their company reputation. ATP interactive AV class board system allows our instructors to easily tap into YouTube videos or internet to offer real time information past or present. These capabilities allow ATP to offer students helpful hyperlinks that can be useful after training is completed. It also allows for questions to our instructors while in a classroom environment. ATP does provide a student manual that can be used as a desk reference for each student that participates in our training. These manuals are to be used as reference only and do not replace the regulatory manuals needed for the training. ATP Training, because textbooks won’t be certifying your cargo; your people will.